John Gardner was still teaching at the Royal Academy of Music when I was there in the 1980s, and I received some valuable lessons at orchestration classes where he unfortunately had to put up with singers and the like who, obliged to complete the subject for their course work, had no interest in the subject whatever. I enjoyed his gruff directness and avuncular style, and remember him inviting me to throw in everything to my work: “nobody’s going to play the thing, so why not?” and so I would be allowed go off and play with impractical but satisfying Sibelian effects like huge trombone sections and colourful percussion. One other golden tip was always to make sure you have more staves on your manuscript paper than you think you will need when you start. “You’ll always find yourself needing more – you can never have too many”, and it’s a truth which has kept me in good stead for the last twenty years. I also remember many amiable hours in the Academy bar spent over many gin and tonics – John was always ready with an entertaining anecdote and was a very good friend even to shy and retiring types like I was all those years ago. The overture is fun, but the invention and searching seriousness of the Piano Concerto No.1 is in a different league. Given its première by Sir John Barbirolli at the Cheltenham Festival in 1957, the performance with as soloist Cyril Preedy failed to launch the piece as a staple of the repertoire, and other than a brief revival by Malcolm Binns in 1965 the work has lain dormant until the present recording. 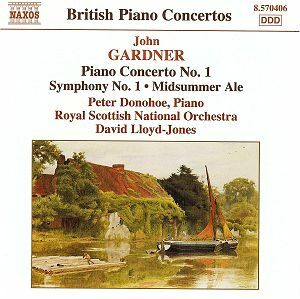 As one might expect, Peter Donohoe is entirely convincing, indeed brilliant as soloist, and the orchestra pulls no punches in the energetic opening Allegro con brio, the balance of the recording realistic in the way that the piano is pitted directly against the orchestra in a grim battle for supremacy. An atmospheric final section concludes the first movement, and wind solos and climbing figures from the piano wind through a bed of restless chords in the strings. This chorale-like harmonic movement is taken up by the soloist in the second movement, whose Tema con Variazioni moves darkly though a nocturne of cinematic gorgeousness. The more lively development recalls Bartók in places, and the whole movement has a rich strangeness which is entirely fascinating. This moves directly into a Finale: Rondo which introduces a kind of fugal resolution, using material from the other movements. Something about the intervals Gardner uses bring my ear back to Bartók, but his idiom is of course entirely different, if hard to categorise. Perhaps this has been a problem in ‘selling’ Gardner’s music – if it lacks an immediate sense of Englishness than how to categorise it? To European ears it would probably be more immediately associated with a British tradition than anything else, but one can sense the work seeking out worlds beyond that island’s shores. This is also true of the Symphony No.1, which has however fared a little better than the concerto, receiving a number of performances since its première, again under the baton of John Barbirolli, this time at the Cheltenham Festival of 1951. The work’s success brought recognition to Gardner, and a string of subsequent commissions allowed him to become established as a composer. The low opus number of the work comes as a result of the “new start” Gardner made after the war, having withdrawn his pre-war works, but in fact drawing on some of the old material in the composition of the first symphony. As Chris Gardner – the composer’s son if I’m not mistaken – writes in the booklet notes, “to listen to the symphony is to go on a journey, but the themes are tightly integrated and in a constant state of development and transition, and this is what gives the work its cohesion and drives it towards its triumphant final D major chord.” There are many fascinating moments along this journey, and with a scoring which allows for a huge variety of tonal colour, with harp, triple winds and cleverly subtle use of percussion Gardner allows himself plenty of room for all kinds of expression within this wide palette. Moments of lilting melody and passages of chamber-music like ensemble writing vary the potential power of the orchestra in full cry, and one can immediately sense the appeal this work would have on any audience. It is approachable but complex at the same time, at times relaxed and/or ebullient without being vapid or superficial. There are tunes which have an air of folk-like familiarity, but like those of Malcolm Arnold they are elusive – conjuring nostalgia, but quite from where or why one knows not. Unlike Arnold, Gardner’s seriousness of purpose prevents him from straying from the idiomatic path he has set himself, and while the work is in no way dour there is no sense of sardonic cynicism in his elegant whiffs of contact with the more commonplace.